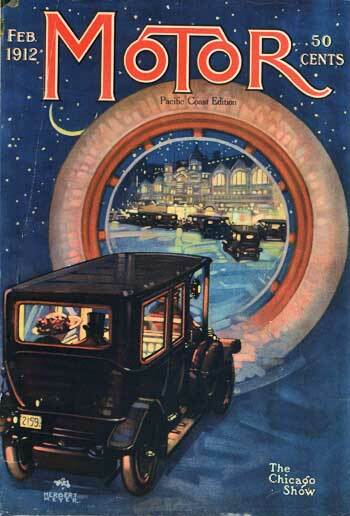 February 1912 cover. A chauffeur-driven car with a couple in the rear seat dressed for the opera (she wears a flowered hat, he a top hat) is about to drive through a white tire portal into a scene of cars lining up to let opera patrons alight. Artist Herbert Meyer (1882 — 1960), best known for his landscape, genre, and still life paintings, studied at the Art Students League with John Henry Twachtman (impressionist landscapes), Harry Siddons Mowbray (decorative work), and Frank Vincent du Mond (illustration and impressionist painting). Although he considered commercial art beneath him, it got him his start. He drew advertisements in the late teens and early twenties for such products as Dubbelbilt boys' clothes, Chalmers underwear, Klever Kraft silverware, Western Electric portable sewing machines, and the Oxweld Acetylene Company. Married to fellow artist Anne Norton Meyer, their daughter Felice was also an artist. She went on to marry famed painter Reginald Marsh (who recorded life in New York City in the twenties and thirties). In 1928, Meyer went to Paris for two years to study art. He claimed that the artists who had influenced him most were Japanese artist Hokusai (printmaker) and French post-impressionist Paul Cezanne. Returning to the States in 1930, he settled in Dorset, Vermont. He exhibited his art at venues as varied as the Art Institute of Chicago, the Pennsylvania Academy of the Fine Arts, the Corcoran Gallery in Washington D.C., the Art Directors' Club, the Whitney Museum of American Art and the Macbeth Gallery in New York City (where he had a one-man show in 1939). His paintings were most often canvases of Vermont scenes and still lifes. He also illustrated Longfellow's The Song of Hiawatha, though the publication did not appear until 1975. A founding member of "Dorset Painters", he held memberships in the New York Guild of Free Lance Artists; the New York Water Color Club; the New York Architectural League; the National Academy of Design; the Salmagundi Club, and the American Watercolor Society.